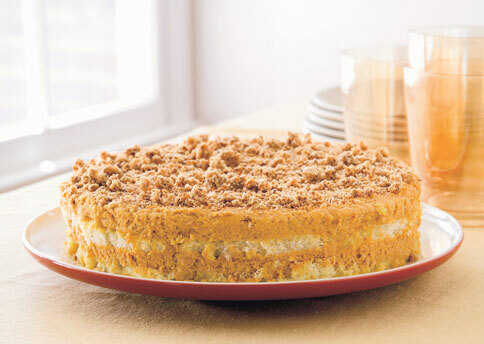 If you're looking for a twist on the traditional pumpkin pie, this is it! Cloud-like layers of pumpkin mousse and sweet ladyfingers. This dessert is light, creamy and perfectly spiced. The added bonus - it's so much easier than pumpkin pie! Beat heavy cream, sugar and vanilla until stiff peaks form. Add mascarpone cheese, pumpkin, cinnamon, nutmeg and cloves; beat just until filling is smooth. Line the bottom of 9-inch-diameter springform pan with 12 of the ladyfingers, overlapping and crowding to fit. Brush with ½ the Kahlua. Spread half of the filling over ladyfingers. Repeat with remaining ladyfingers, remaining Kahlua, and remaining filling. Smooth the top and wrap tightly and chill overnight. To unmold, run a small, sharp knife around inside edge of pan. Release pan sides; sprinkle with amaretti cookies. *Mascarpone cheese (Italian cream cheese) and amaretti cookies (Italian macaroons) are available at many supermarkets and Italian markets.